This tasting and dinner was organised in Glasgow’s venerable restaurant, the Ubiquitous Chip, which has just been awarded Best German Wine List” by the AA Guide. The estate of Maximin Grünhäus is acknowledged to be one of the great estates of the Mosel-Saar-Ruwer, and of Germany. Established in the 6th Century, Carl Schubert’s great great grandfather bought the estate in 1882, and it is wholly-owned by the family. The name of the estate, and its vineyards, dates back to the 6th century when Emperor Otto the First gave the estate and the vineyards to the Benedictine Monastery of St. Maximin in Trier. The Maximin Grünhäuser vineyard covers around 80 acres of steep, south-facing hillside. Riesling is the only grape grown, and the site has a micro-climate which ensures good quality grapes, even in difficult years. The vineyards employ organic agricultural principles and the grapes are harvested by hand requiring between three and seven separate pickings. The Bruderberg vineyard has light soil of weathered slate and is located at the bottom of the slope. It tends to produce powerful wines with traces of minerality. The Herrenberg consists of a mix of red and blue slate taking up the middle and top part of the hillside and producing wines which are still powerful, with a little more elegance. The Abtsberg is located in the centre, which is the steepest part of the slope, consisting of blue Devonian weathered slate. The wines of this vineyard are very fragrant, with elegance and great balance of intense fruit and acidity. The wines of this site are the best of the vintage, and were traditionally given to the Abbot of the Monastery. The wines were supplied by Carl for the event, but are available in the UK from Raeburn Fine Wines and Justerini and Brooks amongst others. 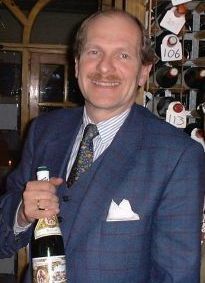 Carl cites 1988 as the most important vintage in modern history for Mosel-Saar-Ruwer wines, simply because there has not been a bad vintage since: most are at least good, with many excellent vintages. Is this another symptom of global warming, or simply good fortune? The wines of Maximin Grünhäus are indeed very, very fine. Each one of these was extremely good and drinking well, including a terrific wine from 1986, a simple “QbA” wine from the Bruderberg vineyard, the lowliest of the range, which was fruity, poised and delicious after 16 years in bottle. Very pale straw/green. Clean, fresh nose with a salty, ozone quality as well as light floral and peachy aromas. On the palate this has medium body with crunchy green apple freshness, sweet fruit and a lingering finish. Good. Deeper medium gold. A delicate blossom and wax bloom over apricot fruit. The palate is weighty and has a gorgeous mouthfilling richness with peach-skin tartness. Length is excellent. A lovely wine. Very pale, almost transparent straw/gold. Clean, crisp and sherbetty nose with a slightly mineral note. Delicate fruit. Light and off-dry on the palate with a powdery softness to the fruit then gentle pear and apple acidity. Lovely balance. Medium gold colour, still a hint of green. Nose of wax and herbaceous leafiness. The palate has become quite dry, but there is plenty of gentle, mouthfilling fruit. Lovely drinking and nicely balanced into a long finish. Very pale, almost transparent, with a distinct green hue. Beautifully ripe and sweet on the nose with pear-drop aromas and a tropical, lychee note. That lovely balance of freshness and luscious weight carries through on the palate. Very fine and whilst lacking the complexity that will come with time, a gorgeous wine. Deepish yellow/gold. Very herbal aspect to the nose, quite leafy with hints of rhubarb, wax, nectarine and orange. Still a fine purity and sweetness in the mouth, with a citrussy freshness and a very long, clean finish. There’s a core of pithy, mineral acidity that gives a lot of backbone. Very good indeed. Very pale straw colour. Quite small, steady bubbles. Clean nose of fresh lemony fruit and just a litlle nettly quality. A hint of sweet apple on the palate, just nuances of biscuity breadth and good acidity. Very fine sekt. This has a delicate nose, with a soft, downy peachiness and a confectionery note. The palate is quite broad and gentle with a really sweet peach and apricot ripeness, but still lovely acidity. Fresh, citrussy notes emerge to keep it crisp, though there is an overall impression of gentle, simple fruit. This has a fine, gentle fruitiness with a succulent pear and peach flesh sweetness. On the palate it has fine elegance, medium weight and lots of sweet fruit. The overriding character is of juicy, fresh melon with clean acidity and very good length. This has a medium gold colour with a lemony freshness. Nose has developed a fine waxy edge. Very clean and fresh, it is only moderately sweet with grippy grapefruit flavours and fine acidity. Good length. A lovely savoury wine. Honeyed nose; lots of flowery, acacia honey and clean orchard fruits. Quite full and luscious, there’s an oiliness to the texture with gorgeous sweet, ripe, pear and apricot fruit sharpened by a mineral and lime zest core of acidity. Lovely.